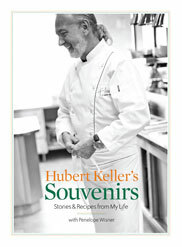 Souvenirs: Stories and Recipes from My Life is a memoir cookbook written by Hubert Keller: chef, restaurateur, and Frenchman. Through personal stories and 120 recipes, the book explores his classical training and traces his development as a creative superstar chef. Keller apprentices in a Michelin three star–rated restaurant at the age of 16. He moves from his native Alsace, to southern France, and is inspired by the cuisine of the sun while working with the great French chefs of his time, Roger Vergé, Paul Bocuse, and Gaston Lenôtre. He learns to adapt to challenging new environments in South America, and the United States, and charts his own path into the newest frontiers of the restaurant business. The book is organized by seminal themes in his life; it starts with his family in France, and ends back there in the “Holiday” chapter. The myriad recipes, which have been adapted for the home cook, are intertwined with 125 of Eric Wolfinger’s luscious images of family and friends, food and cuisine, and the places and landscapes of France, Las Vegas, and San Francisco, which all make up chef Keller’s life. In Burger Bar, Chef Keller and Penelope Wisner show you how to create a mouthwatering, out-of-body burger experience—the ultimate burger. Through easy-to-follow recipes illustrated throughout with gorgeous color photographs, this cookbook features a collection of 50 succulent burgers complete with Keller’s personal suggestions for sauces, buns, and condiments. The real beauty of this book—other than the burgers themselves—is that you can re-create the customized, build-your-own concept of Burger Bar. You can suit your taste, time, and budget by paring down presentation or by borrowing condiments or sauces, and even techniques, from one recipe and applying them to another. 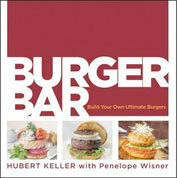 Keller encourages you to try the burgers that have won over thousands of fans and make your own burger masterpieces. In addition, you’ll find recipes for spectacular fries and sides, as well as guidance in selecting meat, forming patties, pairing burgers with beer, and cooking the juiciest burgers you’ve ever tasted.